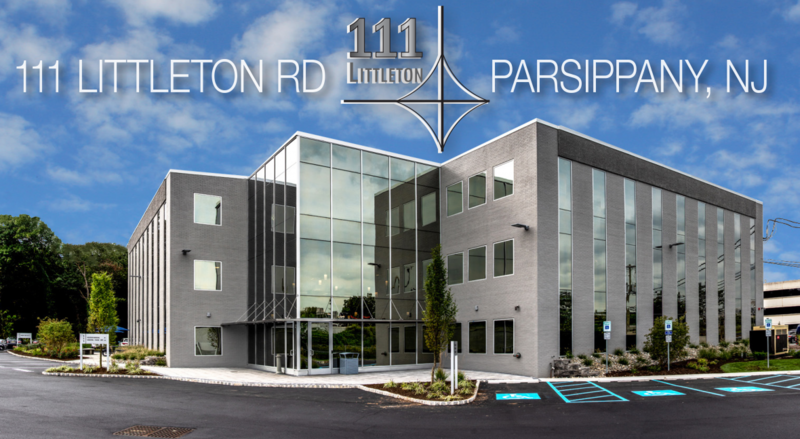 111 Littleton Rd (formerly 119 Littleton Rd) is a three story, 36,389 sf office building located in the heart of Parsippany, NJ. The building had been fully leased by an insurance firm for the last 15 years. Based on an announcement of a consolidation early in 2015, ownership decided to sell the building. Commercial Realty Group (CRG), one of Morris County’s most noteworthy developers, saw the building had potential and purchased it with the commitment of bringing the building up-to-date with a redevelopment plan that will make it THE most noteworthy Class A office building in comparison to the smaller buildings in the marketplace. Plans are inclusive of a complete renovation of the exterior and interior. A CRG signature accent includes the construction of a new three-story atrium entranceway. Further improvements include an entirely new outside glass and steel skin (see Plans), windows, landscaping and a new parking lot. These upgrades will make the appearance and first impressions of 111 Littleton simply spectacular. Interior renovations and upgrades are too many to list but include all common areas and bathrooms, mechanicals, and elevator. The building will be first class in every conceivable manner! As a smaller office building, it can easily handle tenants as small as 1,200 sf or a tenant can occupy the entire third floor at 13,628 sf. 111 Littleton is a center core building with 6 corners on each floor allowing for maximum efficiency and excellent window lines for large and small tenants alike. Since the interiors have been completely gutted, tenants will receive all new construction fit-ups with landlord’s planning assistance so each suite will be designed, constructed and completed specific to each tenant’s needs. 111 Littleton has unmatched location with multiple access to the ingress/egress of Route 202, Route 46, I-80 & I-287. It’s also within immediate proximity to I-280 and Route 24. Morris County and Newark International airports are a short drive. Restaurants, hotels and shopping are all within the immediate area. Lastly, there are multiple banking and retail establishments in the immediate area. View the About tab to view the location maps. CRG will be located in the building and assume all responsibilities of construction and management of the grounds and building.